Unless you’ve been hiding under a rock, you are fully aware that Frozen is the Disney movie of the decade. If you are like me and have a young daughter, you may have indulged her Queen Elsa and Princess Anna obsession with a plethora of Frozen toys and costumes, and listen to the CD in the car as you run around town. I admit I know EVERY song backwards and forwards, and have lost track of how many times I’ve watched (and acted out scenes from) the movie. Also, if you have a girl, there is a good chance you are hosting a Frozen-themed birthday party this year. Yes, that would be me. 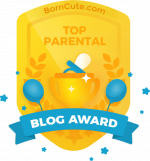 Okay, I know this is primarily a website about fashion and style, but it is also about moms and right now many of us are immersed in Frozen, so hence this post. 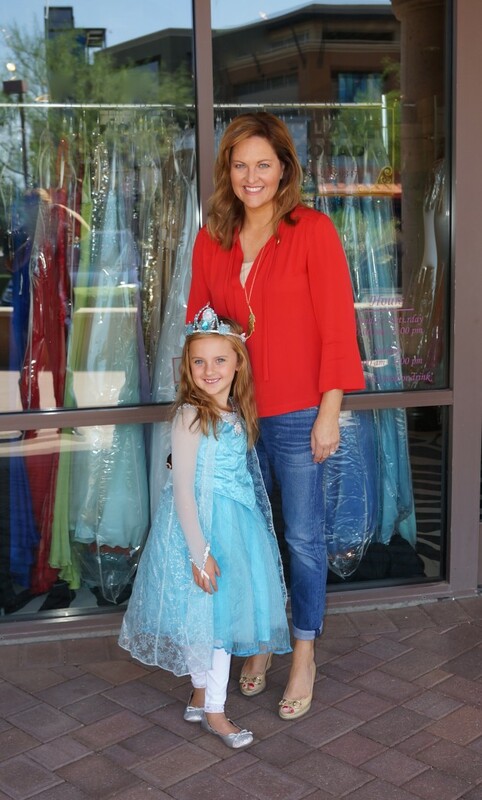 Since my daughter wanted a Frozen party, I went on the hunt for ideas on where to host it and how to make it special. First challenge, my daughter said she really, really wanted Elsa and Anna there to help celebrate. No big deal, right? The families at Disneyland are already waiting in line for around 4 hours, so they can wait a little longer while the royals dash over to wish Christina a Happy Birthday. HA Second challenge, we live in Phoenix where in August it’s 110 plus degrees so anything outside is out and a swimming party isn’t really conducive to Elsa and Anna attending. One of her friend’s already did a Frozen ice skating party earlier in the year and we wanted to be different. Third challenge, the party must be super fun and have a girly theme (as our daughter always wants to wear some sort of princess costume). And challenge number four, mommy does not need a big, stressful undertaking, especially when we will be out of town for a month in July, arriving back home only three days before the party happens. Arriving at Girly Girlz for the party. To the rescue — Girly Girlz in Scottsdale. Girly Girlz hosts theme tea parties and superstar karaoke parties. I called and they were only currently doing tea parties with Elsa, but thought putting together a Frozen-theme karaoke party was a great idea. No-brainer, right? The music is really what made the movie an over-the-top, bonafide hit after all. I talked to Elsa and she thought she could maybe get us an Anna, and she did. Now, I have to say what really made this party special was that our Elsa was phenomenal. Seriously, phenomenal. The lady that plays her gets completely into character and has an amazing singing voice. All the partygoers were completely and utterly enthralled by her. In addition to singing and dancing to the Frozen soundtrack with Elsa and Anna while holding a silver sparkle microphone on a mini-stage, the girls all had their hair braided (one braid for the Elsa look, two for Anna of course), nails painted and made a snowflake headband as a craft activity. 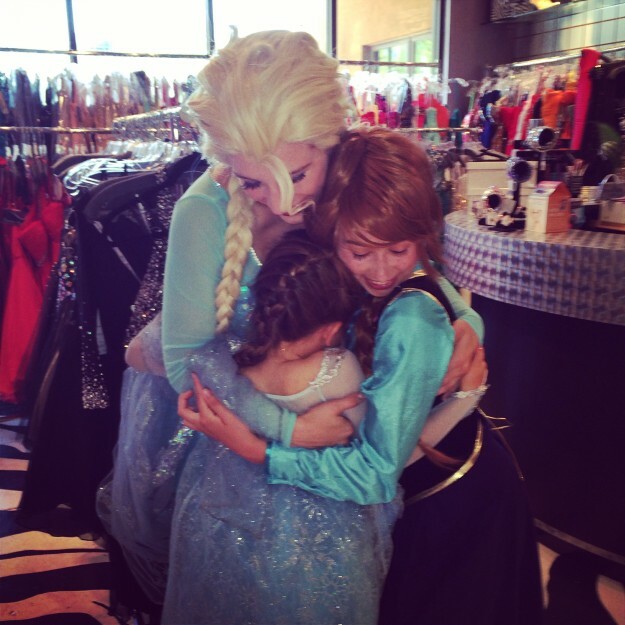 The highlight for Christina had to be performing “Let It Go” with Elsa on stage — a perk of being the birthday girl. 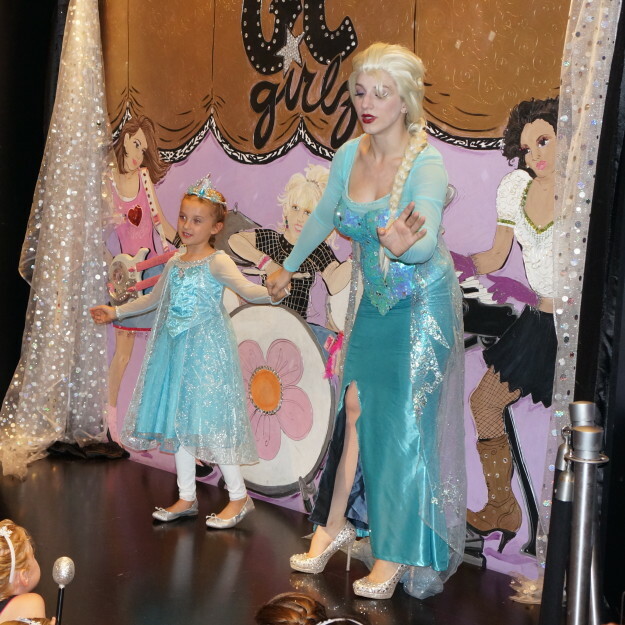 Performing for party-goers with the incomparable Queen Elsa. At the end of the day, the party in the eyes of our daughter and her friends was a big hit — all summed up in this photo of Christina, Elsa and Anna sharing in a group hug. I just love this age… birthdays are so magical. Sharing a warm hug (a little Olaf humor!) 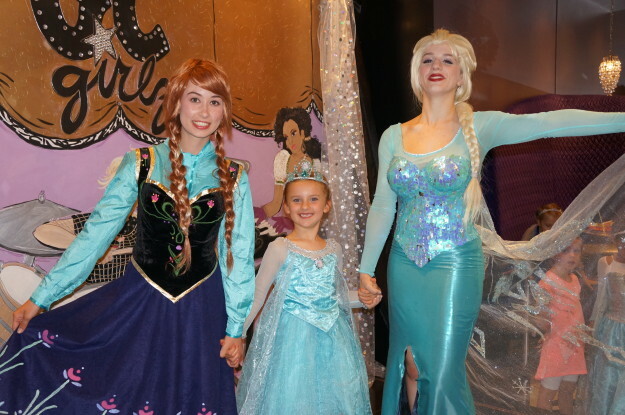 with Elsa and Anna at the end of the party. Side note: For those of you that don’t live in the Phoenix area and don’t have an Girly Girlz-type business in your city, someone should open one. (Business opportunity for you mom entrepreneurs out there!) Moms are constantly on the lookout for new party place ideas as you know.